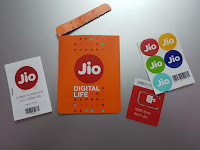 Unlabelled JIO SIM Available online ! JIO SIM Available online ! We many not have patience to stand 3 to 4 Hours in line to get JIO 4G SIM at Reliance Store, Reliance Digital Store. To get JIO 4G Sim we have to give your name, Phone Number and Home Address. JIO SIM will be sent to your doorstep within 7 to 8 Business day's and charges will be Rs.199 per one Sim. Reliance telecom company said that facility is not provided by them and all those who are it are fake.